LED s light based on the biasing voltage available at the base of T1 and T2. NPN transistor conduct when its base is positive and PNP transistor conducts when its base is negative. Before connecting the circuit to the battery, use a variable power supply or partially drained battery( around 10 volts) for calibration. Provide 10 volts (4 volts if used in 6 volt battery) and slowly adjust VR1 to stop Green LED glowing. 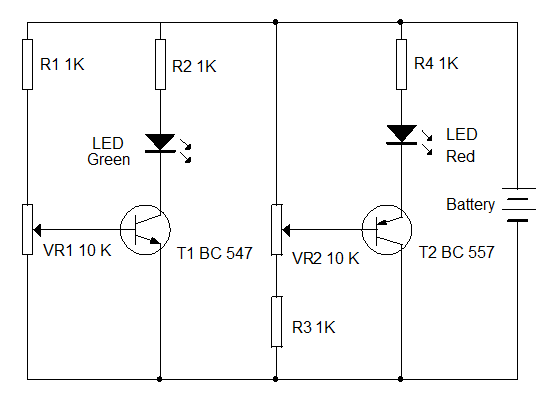 So when the voltage of battery is above 10 volts (4 volts in 6 volt battery) Green LED remains on indicating the normal voltage. After setting VR1, as mentioned above, turn the wiper of VR2 till Red LED turns on off at 10 volts (4 volts in 6 volt battery). So when the battery voltage drops below the set level , Red LED turns on to indicate low battery condition. You can use a Flashing Red LED for getting easy attention. Not spend much time for the theoretical calculation about how the transistors bias, how much current is flowing through presets, how much current LED takes etc. Just assemble and trouble shoot to change the value of components. If the biasing of T1 or T2 is not proper (vary in some makes) reduce the value of VR1 and VR2 to 4.7 K.
i mean resistor R1 should be between VR1 & +Ve of battery. in this circuit if we set VR1 maximum to +ve potential, base of BC 547 will be directly to +ve terminal. since it is npn transistor, transistor get damage. For BC 557 , resistor R3 is given to ground ,and is ok since BC 557 is PNP.